CANNABIS: THE FACTS, HUMAN RIGHTS AND THE LAW; THE REPORT. Official facts on Cannabis/ Marijuana/ Hemp. In the meantime, to find out about THE REPORT, please visit this page on a desktop computer. by Kenn d'Oudney & Joanna d'Oudney. 262 pages, large size 8½" x 11" Paperback. NOBEL LAUREATE PROFESSOR MILTON FRIEDMAN, Economics' Adviser to U.S. government (Reagan Administration); Author, video and TV series writer and presenter; Senior Research Fellow, Hoover Institution on War, Revolution and Peace; Professor Emeritus, University of Chicago. PROFESSOR PATRICK D. WALL, Author; Professor of Physiology, UMDS St. Thomas's (Teaching) Hospital, London; Fellow of the Royal Society; DM, FRCP. THE HON. JONATHON PORRITT, Bt., Adviser to U.K. government on Environment; Author; Founder, Friends of the Earth; TV series writer and presenter. "I have just finished reading your and Joanna's book on Cannabis. It is a masterpiece on both drug prohibition and jury rights. Thanks to both of you for writing it." PROFESSOR JULIAN HEICKLEN, Jury Rights Activist; U.S. National Coordinator, Tyranny Fighters Campaign. U.S. JUDGE's letter to Authors. "THE REPORT's thesis is sound." U.K. JUDGE's letter to Authors. The expert Empirical Studies [i.e. the clinical monitored research of 'hands-on' actual long and short-term use by human test subjects] are DEFINITIVE. These unanimously conclude: firstly, the benign nature of the non-addictive, non-toxic herb; secondly, numerous efficacious applications in curative and preventive medicine (cf. official Pharmacopoeias), replacing lucrative lines of toxic, addictive ineffectual pharmaceutical laboratory-derived chemical drugs; and thirdly, the complete exoneration of cannabis from 'skill impairment' (including driving tests) and all allegations of mental or physical 'harm', from 'danger', 'carcinosis', 'psychosis', 'amotivation', 'abuse', and 'misuse', etc. Full technical and scientific attribution for these Findings of Fact is given in THE REPORT; see Parts One through Six; and Index & Bibliography. Although the official Empirical Studies investigate and categorically refute all allegations of 'harm' and 'impairment', nevertheless, those representing the financial interests of government, of pharmaceutical corporations, and of others, mendaciously circulate the derogatory fictions which do not come from and are dismissed by the definitive empirical studies. Faced with this shocking discrepancy between exonerative facts and malindoctrination, people find themselves perplexed and ask "if cannabis is clinically proven to be harmless, why does the government say the contrary and punish innocent people ?" THE REPORT reveals that the disinformation results from a massive but concealed motive. When investigating allegations of "impairment," clinician-professors relate how, on occasion, research subjects enjoying effects and thinking themselves "too stoned" to perform adequately, would ask to be excused the tests, which were still insisted upon. Then, on testing, the subjects were surprised to find themselves able to perform as well as, or better than without marijuana. This finding proved to be replicable. That even the regular users were "surprised" their tests' results confirmed no decrements derive from use of cannabis, indicates they had been prepossessed by the false indoctrination. THE REPORT investigates laboratory toxic chemical extract THC, which, within the plant itself, is compounded into a harmless chemically different form. THC studies are perjuriously 'extrapolated' as "new research on cannabis." THE REPORT also investigates the other sources of the ongoing fabricated derogation of cannabis. Cannabis is officially exempted from all legislation, regulation or control founded on 'harm' criteria. All private cultivation, trade, possession and use are vindicated. Based on the research-established esoteric Empirical Evidence, THE REPORT is an authoritative insight into the real, but concealed, illegal reason behind Prohibition: ulterior money-motive. THE REPORT's analysis covers all the uses of cannabis. Technical, scientific source references and attribution given. Index and helpful large Bibliography. Secondary / Undergraduate / Post-Graduate / General and Professional readership. THE REPORT has been purchased by the U.S. Library of Congress, the U.S. National Library, the British Government Home Office (ISDD), Scottish Office (Home Affairs), House of Lords (U.K. parliament), Harvard University School of Medicine, the University of Cambridge Institute of Criminology, and EuroPol, etc. THE REPORT is being ordered by academic, law, and medical libraries, and by institutional, government, public and school libraries, and by individual readers worldwide. SCIENTIFIC SOLUTION TO THE WORLD CRISIS. "For Mankind's macroeconomic requirements, energy derived from cannabis is cheaper than energy from coal, oil, natural gas, uranium, wind and wave-power, ethanol, geo-thermal, bio-diesel and pressed-seed vegetable oils, hydrogen-from-water electrical separation, etc. Cannabis is the most economical resource to fuel and energy known to Mankind. Cannabis-Methanol provides fuel which is pollution-free." These statements are demonstrated as fact, for the first time on record, by the analysis given which comprises The Cannabis Biomass Energy Equation (CBEE), in Part Two of THE REPORT. "To the question, 'Scientific Solution-why cannabis ? '- the answer follows:"
"Firstly, Cannabis Sativa is the most prolific and quick-growing bulk-producing wood-plant species. Secondly, the best explanation of how cannabis can replace Mankind's misuse of fossils and uranium as 'fuel', is contained in the following axiom:"
"Everything which is derived from hydrocarbons can also be derived from carbohydrates." "Carbohydrates are the basis of biomass; that is, organic material, plants and organisms. Oil and coal are fossilised biomass. All are carbon-based matter. Commercial goods (plastics, man-made fibres, products, paints, chemicals, etc.) fuel, and energy now extracted from oil and coal can equally be produced from fresh, recently grown biomass. The technical viability of biomass as a resource to fuel and energy is well established and demonstrated." to Obtain Fuel & Products. ~juvenile to mature plants yield all grades of natural fibre for textiles, clothing, velours, etc. (also see Dresden Cotton ®). 77 to 80 per cent of the (bulk wood) biomass of cannabis is comprised of cellulose, a carbohydrate ideal for conversion into the hydrocarbons of fuel. Improved on by modern techniques to achieve efficient conversion of biomass into fuel, pyrolysis is one of Mankind's earliest technologies, an ancient skill used in Pharaonic times to produce oleaginous embalming fluid for mummification. The same process is used today to refine oil. Pyrolysis should not be confused with bio-chemical conversion (fermentation) of sugar-to-alcohol which is a capital-investment intensive (costly), slow, and itself an energy-consuming method producing the inferior ethanol not methanol. By contrast, pyrolysis produces the variety of liquid fuels and lubricants type-similar to gasoline and subterranean oil, but without pollution. Pyrolysis is the decomposing of biomass (fresh or fossil) by the heat of anaerobic (reduced air) combustion which converts organic material into gases and/or fuel oils. In this way, Cannabis Biomass is the direct substitute for the fossilised biomass of coal and petroleum. With the hot 'off-gases' collected, which cool to condense into liquid fuels, pyrolysis is also known in modern refining as 'thermochemical decomposition' or as 'wood distillation', or as 'destructive distillation'. Methanol has been the official fuel to power the racing cars of the famed Indy 500 Series for the last thirty years. Ridiculously, because of prohibition, it is synthesised by costly energy-consuming industrial procedures from subterranean oil, instead of from cost-free by-products of cannabis. Cannabis is the most prolific, cultivable dry biomass cellulose-wood-plant species on Earth, uniquely and immediately capable of the economical (cheap) replacement of all Mankind's misuse of high-pollutant, costly fossils and uranium for energy, petro-chemical products, lubricants, fuel-oils, petrol-gasoline and all types of plastic (cellulosic polymers). THE FREE SOURCE OF WORLD FUEL-ENERGY. N.B. When cannabis is cultivated for its profitable nutritious seed-food (which, as noted, does not contain relaxant ingredients), all the by-products listed above (which are source to literally thousands of commerical products), are derived from a resource which is thus production-cost-free (i.e. free). To recapitulate, the free fibres and free cellulose-rich wood-hurd bulk residues, flowertops and foliage, yield economical (cheap) cannabis products which include the illimitable fuel and energy, all types of plastic products, fine-grade yarn and Dresden Cotton ®, textiles, paper, cardboard, newsprint, man-made fibres (by cellulosic polymerisation, e.g. nylon), medication, lightweight building materials (Isochanvre ®) etc. A. The U.S. National "Soil Bank's" registered fallow land (circa 54 million acres in 2010 + large areas of little utilised land) can be planted with soil-enriching, non-depletive cannabis as a fallow rotation crop, producing enough Cannabis-Methanol, oil, lubricants and BTU-gas for all North American land, sea and air transportation requirements. B. Dresden Cotton ® is the name given to the textile product made by the cheap cold-chlorination process which converts (production-cost-free, i.e. free) cannabis fibres, making them indistinguishable from cotton. By adding the Mississippi Cotton Region to the acreage of the national Soil Bank, sufficient cannabis fuel is produced for all foreseeable U.S. power-plant production of electricity for industrial and domestic use. Ergo: The energy-voracious U.S. nation thereby becomes not only self-sufficient, but a net fuel-energy exporter -- without planting up a single new acre nor subtracting land area from current food production. and It Can Be Cultivated Easily Everywhere. NOTE. Correctly-speaking, hemp and cannabis are synonymous (i.e., words of the same meaning). The word 'hemp' is the ancient and modern Anglo-Saxon English word for the genus named cannabis by the Science of Botany, and includes all varieties and species. Marijuana ('Mary-Jane') is merely a Mexican colloquialism. The U.S. and U.K. legislation of control (prohibition) is an incompetent tangle of incorrectness and perjuries. THE REPORT, Cannabis: The Facts, Human Rights and the Law ISBN 9781902848211 is about cannabis sativa / hemp. Sativa is the smoker's preferred variety for personal relaxant or medication, and includes all the various species popularly called 'skunk'. This very same variety, Sativa, is also the superior species for all industrial purposes, providing profitable nutritious staple seed-food (which does not contain relaxant); and the production-cost-free (i.e. FREE) by-product, cellulose-rich wood-hurds, as the biomass resource to fuel-energy, plastics, paper, etc. "Industrial hemp," which is the 'THC-free' ruderalis and related hybrids, is licensed in some countries and comprises a puny species, low in yield of seed, fibre, and not more than 50-60 per cent (including roots) of the biomass bulk of the real cannabis sativa. In France and Germany we have visited farms where it is cultivated. This so-called "industrial hemp" is hopelessly inadequate for the industrial uses for which it purports to be licensed. The word "industrial" applied to this weak, measly plant, is a misnomer deliberately employed to mislead farmers (and others) into thinking it could be sufficiently productive for industrial purposes. The 'THC-free' "industrial hemp" will not go far to replace oil, coal, and uranium for fuel-energy; nor provide the food staple needed by the starving millions; let alone stopping the use of trees for paper, resourcing the lightweight building material, Isochanvre ®, the modern furniture materials, and replacing oil for plastics and man-made fibres, and so on. If this phony "industrial" hemp ever gets fully legalised it will be a foregone failure -- and that is exactly what the government-corporate vested interests intend. By contrast, Cannabis Sativa Hemp is the full-blooded relaxant plant. 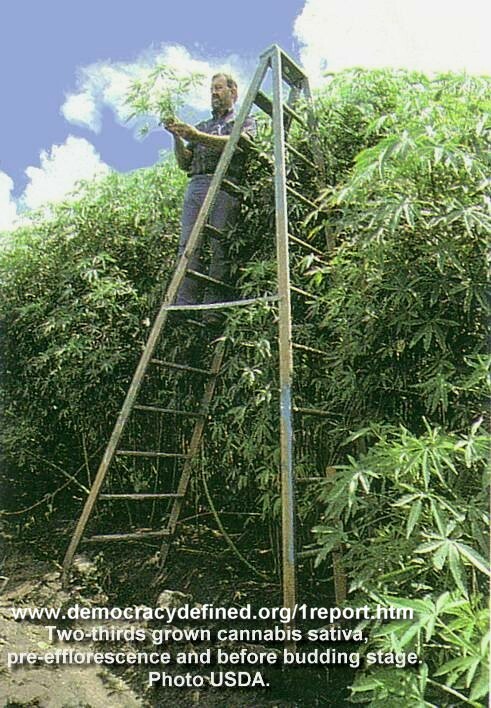 It grows prolifically up to and over 15 feet (c. 5 metres), and has the relaxant and health-promoting properties. Yet, approximately half the weight of the large female plant at maturity is comprised of seed, exceptionally rich in the amino acids requisite for the correct functioning of the human immune system. Combustion of Cannabis-Methanol, CH3OH, emits only water H2O (as steam) and carbon dioxide CO2. Regarding CO2 emission, on combustion, the carbon bonds with oxygen: CO2 is released into the atmosphere; but, an equivalent quantity of carbon is absorbed by the next fuel-crop in cultivation. This is termed a 'closed-cycle' to signify no net increase of atmospheric CO2 is produced by the use of cannabis for fuels. Similarly, the cannabis crop itself has been formed by photosynthesis, subtracting from carbon already in the atmosphere. "From the early hunter-gatherer, nomadic, and tribal agrarian forms of human organisation, to the establishment of permanent urban communities, through the Ancient and Medieval Eras, the small numbers of people on our planet relied principally for their energy supplies upon the abundance of trees and firewood. Demand for fuel-energy was limited and easily satisfied. Fuel was a trifling factor in the Cost of Production of artefacts." "In the Modern Era, local forests having been felled, growing populations availed themselves of coal, oil, natural gas and, eventually, uranium. The disadvantages of nuclear fission, not least of which involves the inevitable proliferation of plutonium availability (the matter of hydrogen fusion bombs) swiftly made themselves evident. Not so obvious, at first, was the danger from the misuse of fossils as 'fuel', which has given rise to the destructive phenomenon, Global Warming, a threat of gravest potential to the ecosphere [the atmospheric, terrestrial and aquatic environment]." "Hegemony, in the physical rather than moral sense, that is, politico-military power and leadership, derives from ownership and control of the means of production and distribution of wealth. Appropriation, or misappropriation, of the sources of fuel-energy became crucial to those with commercial interest and/or political ambition. Acquisition of Ownership of subterranean minerals was facilitated by the expedient of government legislation and by monopoly: the licensing of preferred (state or private) corporations to exclusive trade in the invaluable energy resources. Thus, the People are forced to pay two 'Owners' for fuel." "Governments' fiscal intervention (exorbitant duties, taxation) has led to fuel-energy becoming the principal component in the industrial production of wealth, today accounting for not less than four-fifths (4/5) of the Cost of Production of Gross World Product: all extracted resources, commercial goods, food and services." The Cannabis Biomass Energy Equation shows readers of THE REPORT (with instructions and diagrams) how Cannabis-Methanol is easily made at home or anywhere for free in a simple cast-iron oven, RELEGALISATION achieving the Universal Re-Democratisation of Fuel-Energy Production (URFEP). This yields to domestic, small-scale and localised private enterprises, the profits which currently accrue undeservedly to giant corporations and oil-producing countries' governments. The CBEE proffers free and duty-free fuel everywhere; it makes the outrageous duties and taxes on fuel uncollectable; and it eliminates the unwarranted government-corporate monopolistic stranglehold on fuel-energy supply. Susceptible, manipulated and overwhelmed by their venality, and intensely driven by the desire to retain the hegemony which derives from monopoly and control over fuel-energy supply, government-corporate vested interests of all political persuasions install the fraudulent Prohibition of the world's most prolific and economical fuel-energy resource: cannabis sativa. THE REPORT's legal studies and exposition, together with the Economics of The CBEE and its associated political and social facts, amount to a philosophy and a unique solution: The RESTORATION Program. Adoption of this Program proffers a beneficent transformation to mankind's socio-political modus vivendi, and to the global economy. It enables an exponential amelioration of the entire world population's Standard of Living, while simultaneously eradicating poverty and famine. THE REPORT quotes legal grounds (national and international) which demonstrate numerous infractions of laws by the prohibition legislation, and which show all acts of its enforcement to be crime per se. All citizens persecuted thereunder are due Amnesty and Restitution (as for other Wrongful Penalisation). "Cannabis Prohibition is the greatest fraud of all time: the pernicious effects of this crime are myriad, extreme and ubiquitous. Readers assimilate that Prohibition is the direct cause of: War (e.g. Iraqi invasion of Kuwait to acquire hegemony over oil); Crime; astronomical world energy, resource and food prices, with disastrous and homicidal corollary effects; world poverty; world famine; industrial and automotive emissions poisoning air; photochemical smog and Acid Rain; desertification; the Greenhouse Effect, Global Warming and fatally catastrophic weather; and that RESTORATION is the immediate Scientific Solution." With modern technical and scientific evidence, collated from the esoteric Findings of Fact and Conclusions of the empirical studies conducted by world-respected academic and research institutions, presented in consideration of existing laws, national and international, THE REPORT ISBN 9781902848211 constitutes the formal public indictment of Western (and other) governments: i.e. the money-motivated prohibitionists who have framed and maintain legislation which is demonstrated by THE REPORT to be unfounded, crime-producing, inequitable, venal, and perjurious. Incidentally, by RELEGALISATION each continent is capable of producing surplus cannabis-fuel for all energy needs, which eliminates production from marine oil rigs and transport by ocean-going oil-tankers, rendering their related environmental disasters a thing of the past. By their Prohibition, politicians are directly accountable for all the repeated ecological catastrophes. Implementation of The RESTORATION Program delineated in THE REPORT will radically ameliorate the entire world population's quality of life. 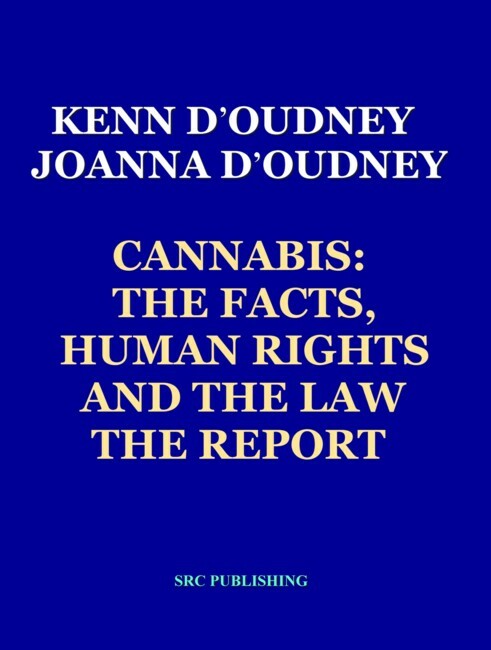 CANNABIS: THE FACTS, HUMAN RIGHTS AND THE LAW, THE REPORT.PAPERBACK 254 pages. Large-size 8½ x 11 ins (279 x 216 mm). ISBN 9781902848211. Latest Edition. DEMOCRACY DEFINED books militate on behalf of Democracy, personal, political and religious Freedom, Truth, Knowledge, Justice and Liberty, to promote the well-being of people everywhere.